Checklist for Your Move-out | Wohnungsreferat Stuttgart e.V. Note: This page only applys to tenants that already have a contract with us. You certainly want your move-out to be uncomplicated. For this reason, we provide a check list for you containing the main points that we attach importance to and the hidden spots of cleaning. If the room is not sufficiently cleaned, we are unfortunately obliged to have you clean the room again. Please take your time to clean the room thoroughly. 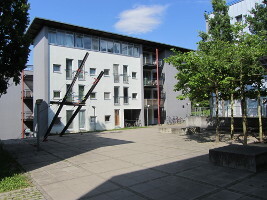 Shared floor (Allmandring I): You have your own room and share the kitchen and the bathroom with other roommates of the shared floor. Apartment (Allmandring I): You have your own bathroom and kitchen furniture integrated in your room. Shared flat: All rooms in Allmandring II or III are shared flats which means that you share the kitchen and the bathroom with a maximum of four other inhabitants in the same flat. Shared floors: Every shared kitchen has got cleaning buckets, etc. Allmandring II/III: Every shared flat should own a vacuum cleaner/cleaning swab. In Allmandring III, there is a vacuum cleaner in every house. A sign on a flat door shows you where it is currently located. The room has to be empty, except for the inventory of the dormitory. Landlord: Small things like a lamp or mirror can be left in the room, as far as you move in again. Everything else has to be arranged with us and maybe with the subtenant. Especially the closet has to be useable. Please clean the furniture with a wet cleaning rag. Please clean the windows with a wet cleaning rag. Also open the window and remove dirt from the frame. Please air out the room. Allmandring I, shared floors: The kitchen rack with the respective room number and the refrigerator rack must be empty and clean. Allmandring II/III: The shared flat (kitchen, bathroom, WC) has to be cleaned recently, should be arranged with the roommates. The balcony must be free of any trash.